Honey bees born in the spring and summer have a different physiology from the bees born in the fall. The bees that live in the warm seasons live from five to six weeks. Honey bees born in September and October, however, can live for up to six months. The considerable difference in the life expectancy of the fall bees is due to differences in physiology and lesser flying in the winter. In the spring and summer, the colony produces great numbers of bees to exploit the available flowers. Young bees spend the first three weeks of their lives in the hive performing a series of jobs related to their age. Their first job is cleaning the cells of the brood nest. Their next job is feeding the larvae. This job follows the development of the young worker bees’ glands that produce the larval food. The queen bee must continue to lay eggs during the early fall in order for there to be workers to feed the brood during next February and March. An inspection of the bee hive in the late summer and early fall should find a large population of bees. 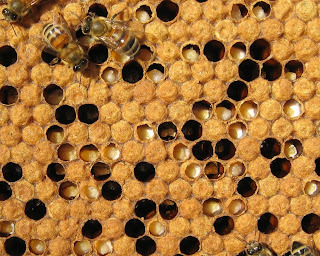 The first indication of the population of the hive is a number of bees on the inner cover of the hive. If the hive is healthy and there is a prolific queen laying eggs, the hive will have bees spilling over the tops of the frames as well. That is the case in the picture of a hive with its large summer population. The majority of these bees will die before the end of winter; only bees born in the fall will be available for feeding the colony’s brood at the end of winter. To ensure that there will be long-lived bees with highly developed food-producing glands, the beekeeper often provides supplemental feeding to encourage the queen to continue laying eggs into the fall. The importance of honey bees and insect pollinators for the production of our fruit and vegetable foods is readily seen. At least one third of our diet is dependent upon insect pollinators to complete pollination of the flowering plants as they visit the flowers seeking nectar and pollen. However, the role of the bees in the production of our meats and dairy foods is not quite as obvious. 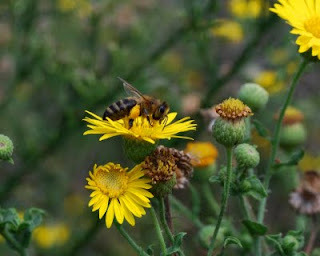 Many of the high-protein food sources for cattle are flowering plants that require bee pollination for seed production. One of the major forage crops for cattle is lespedeza, as shown in today’s photo. A honey bee is collecting nectar from the tiny flowers of trailing lespedeza. I find at least three common species of lespedeza here at Peace Bee Farm. Other cattle feeds that require bee pollination to produce seeds are clover and alfalfa. Each of these forage plants are members of the important bee plant family of legumes. The legumes are important to the bees, because they provide large amounts of nectar and pollen. The bees are important to the legumes, because they need the bees for reproduction. The legumes provide a sizable amount of the feed required to support the production of meat, milk, and cheese. Not only do the legumes provide food for cattle, they also support considerable wildlife, including animals from rabbits to deer. One of the most important effects of having healthy legumes is that they enrich the soil, because many have nitrogen-fixing bacteria in nodules on the roots. These bacteria take nitrogen from the atmosphere and convert it to a usable state in the soil. As the principal pollinator, the honey bee plays a critical role in our food production and the health of the environment. European cave paintings showing men risking their lives while climbing cliffs to gather honey while alerted bees circle these determined men holding smoking torches illustrate that man has sought out honey bees to rob their nests for thousands of years. Honey is the only food that we have today that is unchanged from that product of the honey bee that the cave men ate. Until the invention of the removable frame bee hive by Philadelphia, Pennsylvania minister Lorenzo Langstroth in 1851 and the subsequent invention of the honey extractor, all methods of gathering honey were destructive of the colony or the comb. Those robbing bees would usually kill the colony of honey bees with smoke and fire and then remove the combs of honey from the hive. Other men, practiced in robbing bee hives, would use smoke to calm the bees and then gently remove chunks of comb with honey by hand to be eaten. They ate the beeswax comb and the honey. If one wanted to remove the honey from the comb, the comb would be pressed. Even today, pressing the comb is a major method of collecting honey throughout the world. Long after the invention of the removal frame bee hive there continued a tradition of hunting for bee trees. People would track foraging honey bees throughout the year and follow them back to their nest in a hollow tree. They would usually wait till cool weather, cut the tree to expose the honey bee nest, and remove the honey comb. Following this tradition of collecting honey in the comb, many people enjoy eating their honey this way. Today, most honey is extracted from the combs, and then the frames of comb are stored over winter to be returned to the bee hives for the next year’s honey crop. In the photo Rita is preparing cut comb honey. The combs may be enjoyed on hot buttered biscuits or on ice cream. When beekeepers meet those who don’t handle honey bees, the first question asked is usually, “How often do you get stung?” Many in the public feel that honey bees are to be left alone because they sting. True, honey bees are stinging insects. They belong to the same order as wasps, hornets, yellow jackets, bumblebees, and numerous solitary bees. Generally, honey bees only sting when mashed or while defending their hive. Children learn at an early age that stepping barefooted on bees foraging in clover will guarantee a sting. Also, honey bees will sting any time that we carelessly mash a bee with our hands. Honey bees do vigorously defend their hive from attack from other insects, mammals, and even beekeepers. Carnivorous wasps, hornets, and yellow jackets regularly attempt to enter bee hives. Robber honey bees from other colonies may be the greatest threat to the hive. Hives are also attacked by skunks, raccoons, and, in some areas, bears. Beekeepers are considered an intruder by the bees unless the beekeeper moves gently while manipulating the hive. Beekeepers regularly use smoke to interrupt the pheromone communications of the guard bees. In defense of their hive, the guard bees use their barbed sting, planting it firmly in the skin. Attached to the intruder’s skin, the sting contains a venom sac, muscles to continue to pump the venom, and alarm pheromone glands. The pheromones alert other guard bees and mark the intruder’s location. Stinging an intruder is fatal to the guard bee, but she helps defend the colony by summoning other guard bees to multiply the number of available stings. 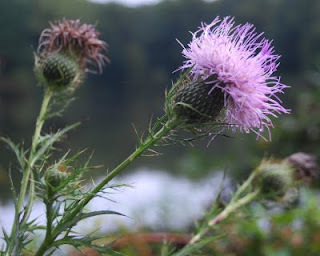 When I came across field thistle in bloom, it was during a brief intermission in periods of rain. When the sun broke out, butterflies dropped in to collect thistle nectar. It’s been a rainy summer. Harvesting honey during weather conditions not suited for opening the hives, I found myself the target of guard bees defending their nest. They performed well. Honey varies in color and flavor as a result of the different flower nectars that the honey bees bring into the hive. Honey is often labeled according to its principal nectar source. Florida’s orange blossom, honey is quite popular as is tupelo honey from South Georgia and sourwood honey from Appalachia. Each honey is known for its distinct flavors. These honeys are harvested by removing the honey supers from the hives after the bloom of the citrus, tupelo, or sourwood trees. When we harvest honey, it may have the appearance and flavor of a particular floral source; however, the honey is probably the sum of dozens of different flowers. In the Arkansas Delta, the principal nectar sources are agricultural crops, mainly soybeans and cotton. 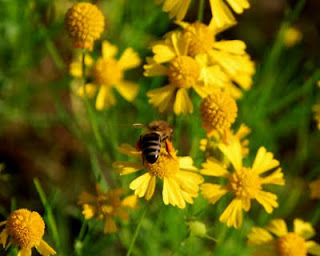 However, the Delta honey is made up of numerous wildflowers as well. The diversity of nectar sources adds to the complexity of the flavors of honeys that he hives produce. Having a diversity of plant life is very important for good honey bee nutrition. It insures that there will be a continuous flow of nectar coming into the hive throughout the spring, summer, and fall. A diversity of plants also insures that there will be high-quality protein food for developing honey bee brood. The protein, as well as vitamins and minerals, is contained in the flowers’ pollen. At Peace Bee Farm, we encourage many native wildflowers to grow in open and wooded areas. The bees will choose which flowers to forage according to the amount of sugars in the nectar and the availability of the flowers. Today’s picture shows a common plant in the understory of woods, poison ivy. 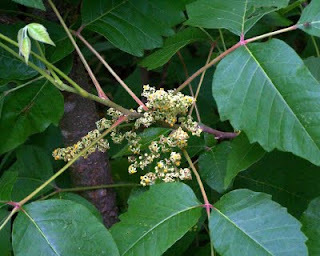 Poison ivy, a plant with sticky, skin-irritating oil on the foliage, has a delicate flower. At times, honey bees collect nectar from poison ivy and produce good, edible honey. After bee pollination, poison ivy produces berries and seeds which are distributed by song birds. Deer browse the foliage. 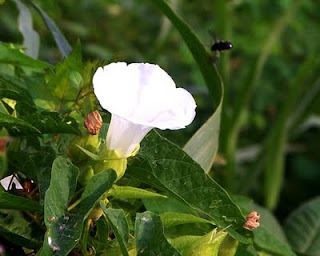 Morning glory, also called hedge bindweed, is in bloom on vines covering fences and idle farm equipment. The prolific vines cover any object in a sunny area. I found a morning glory vine climbing the rope of our old farm bell, which evidently had not been pulled in a while. The flowers are white funnels with tints of lavender. Visiting morning glory shortly after sunrise finds the blossoms being visited by numerous native pollinators. Honey bees prefer to visit flowers with a more open blossom. Click on today’s picture to see a blue orchard bee approaching a morning glory flower. Blue orchard bees, also called mason bees, are shiny, blue-black in color. They are often mistaken for bottle flies. These gentle and fast flying native bees hit a flower hard, and then scrub their bodies around the inside the flower before zooming off. In the process of scrubbing around inside the flowers, the blue orchard bees cover their bodies with pollen which they carry along to the next flower, very effectively pollinating the plant. While honey bees and bumble bees carry their pollen in pollen baskets on their hind legs, blue orchard bees carry their pollen on hairs on the underside of their abdomen. The honey bee is the most widely employed pollinator, but our agriculture, food supply, and even our wildlife are healthier if we have a diversity of pollinators available. Having an assortment of native pollinators available within flying range of agricultural crops makes them more productive. To have a diversity of pollinators we need a diversity of flowering plants and habitats. The Xerces Society for Invertebrate Conservation is dedicated to protecting pollinators The Xerces Society offers plans for managing habitat for native pollinators at their web site, http://www.xerces.org/. It is easy for us to provide flowering plants and nesting places for the blue orchard bees. They are useful and enjoyable to have in the garden. Honey bees are of utmost importance in the production of our food. One third of mankind’s diet is dependent upon insect pollinators. Without pollination, these food plants would not produce fruit and seed. Not only do the honey bees and native pollinators help produce our food, they also help produce food for wildlife and farm animals. Alfalfa, considered the world’s most important forage crop for animals, is grown in the Mid-South as a high-quality feed for horses and cattle. The alfalfa plant may be harvested up to five times per year for high-protein hay. Between cuttings of the hay, the alfalfa may bloom and attract honey bees. Alfalfa is a perennial plant in the important family of bee plants, the legumes. From alfalfa, the bees collect both nectar and pollen. 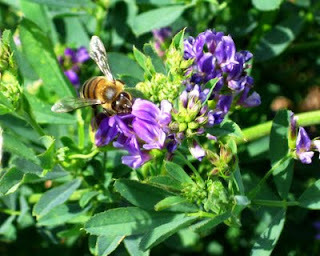 There is one problem that the honey bees encounter in working alfalfa flowers, though. The structure of the alfalfa blossom hides the nectar and pollen from the foraging bee until the flower is physically tripped by a bee. To access the alfalfa pollen and nectar, the bee must press its head against the flower petal until the flower’s male and female parts are exposed. In this process, the flower slaps the bee directly in the face. Understandably, many nectar-gathering honey bees dislike the tripping mechanism of alfalfa. They soon learn to insert their tongues between the petals to remove nectar without tripping the flower. These bees, as a result, don’t pollinate the alfalfa. Pollen-gathering honeybees are effective pollinators, however; because they must trip the flower’s mechanism. Click on today’s photo to see a honey bee negotiating an alfalfa flower. Alfalfa honey is clear to light amber in color with a pleasant, minty flavor. Alfalfa honey has a heavy body and weighs 12 to 13 pounds per gallon while other honeys rarely exceed 12 pounds per gallon. Wax moths never kill a colony of honey bees; but if a colony dies, the hive will likely be taken over by wax moths. Moths are constantly attacking honey bee colonies. Some attempt to enter the hive through the entrance which is protected by guard bees. Other moths have greater success when they light on the bee hives at night and lay their eggs in the cracks between the boxes that make up the hive bodies and honey supers. The larvae, moths in the second of four stages of development, crawl through hive cracks and enter the hive. Strong hives have no problem with wax moths. They have worker bees that detect the intruding moth larvae and eat them. Strong hives also have plenty of worker bees dedicated to sealing the nest with propolis to keep moths out. 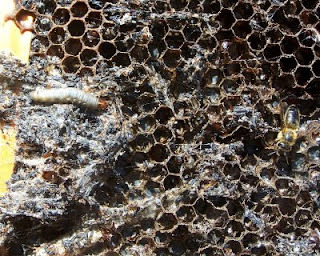 The wax moth larvae grow rapidly on honey, pollen, and comb left in a hive after the bees have died. They burrow through the comb, often in diagonal lines across the frames. Frames attacked by wax moths are easily recognized by the webbing that covers the frame. In the photo we see the damage left by wax moths. A larva crawls across the frame as does a robber bee. Robbers often appear black and shiny with the hair missing from their abdomens from fighting. The small, black rectangles are the waste of the wax moth larvae. A diagonal larval tube tracks across the lower, left side. As the wax moths continue their development, the larvae spin cocoons and eat into the hive wood, leaving indentions that make the hive look like it has been hammered. The Wolf River winds its way across western Tennessee and through the city of Memphis before spilling into the Mississippi River. This tributary, known in past years for its odor and pollution from sewage and industrial waste, has been restored to a beautiful stream by years of efforts by devoted conservationists. Mary Phillips and I made a presentation to interested neighborhood environmentalists about the relationship between honey bees and trees as a part of a day’s event to celebrate the transformation of this river to an urban greenspace corridor. Peace Bee Farm participated as part of an effort to encourage the expansion of tree planting. The portion of the greenspace that we occupied was an abandoned railroad line that had been converted from an overgrown path used by vandals and burglars. The combined efforts of this Midtown Memphis community had turned this into an extended park. A receptive group joined Mary and I to learn about honey bees and other pollinators. Others present included master gardeners and tree experts. The Memphis Zoo sent butterflies. Children joined in for a bike parade along the corridor. 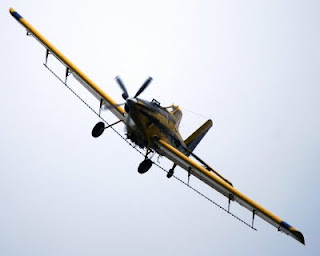 Aerial application of seeds, chemical fertilizers, herbicides, and pesticides are some of the key elements of modern industrial agriculture. These large-scale farms plant fields of monoculture crops on precision-leveled ground using heavy equipment and little manpower. Many fields are irrigated, and herbicide use has largely replaced cultivation for weed control. Aircraft are employed to distribute seeds or chemicals when time constraints or soil conditions make application from the ground impractical. For example tractors can’t be driven in flooded rice fields and soybeans planted in narrow rows grow so closely that they would be damaged if cultivated by tractor. Aerial applicators as well as farmers using ground-based spray equipment pay particular attention to honey bees in the area of their spraying. If they are distributing insecticides, they spray early in the morning or late in the evening when the honey bees are not actively foraging. They are careful not to spray directly onto the hives and to avoid drifting of the spray. However, it is not always obvious that bees are present in a particular field, since they regularly fly two to three miles from the hive to forage. 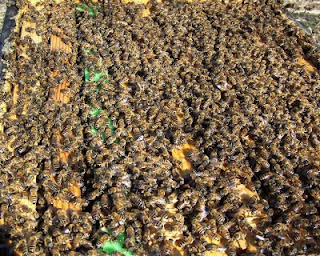 Large-scale die-offs of honey bees from chemical poisoning do occur at times. Insecticides used in boll weevil eradication programs were deadly to honey bees in the area. Beekeepers are still unsure of the safety of some systemic insecticides, like imidacloprid, in common use today. Modern agriculture practiced on an industrial scale is efficient in the production of large quantities of food and fiber. It does impact the honey bees and native pollinators, though. Much of the impact results from the large size of the monoculture fields with no margin for pollinator habitat. Beekeepers and farmers understand that they share in the benefit of healthy bees. Today’s photo shows a high-performance aerial applicator passing low over one of our bee yards in the still air shortly after dawn to spray an adjacent field. Throughout the year there has been a yellow flower in bloom along roadsides and undisturbed field margins. To the casual observer they may seem to be the same flower. However, there has been a progression from dandelion to buttercups to groundsel to mustards to coreopsis. Each has occupied the same ground, replacing its predecessor without a trace. The next bright yellow flower to come into bloom is bitterweed. Bitterweed belongs to the important bee plant family, the composites, or sunflower family, as do each of its predecessors except the mustards. The composite flowers provide both nectar and pollen for the honey bee. Click on the photo and you can see that this honey bee is foraging for pollen from the bitterweed. You can see the orange-colored packets of pollen in the bee’s pollen baskets on her hind legs. The same honey bee will not forage for both nectar and pollen. Other honey bees from the hive will visit this bitterweed plant for nectar. 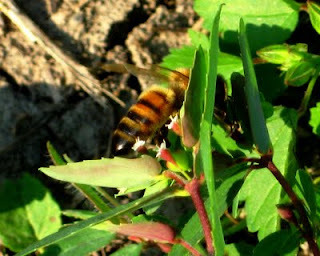 As Charles Darwin observed, the honey bees foraging on bitterweed will continue to forage bitterweed as long as it continues to be useful. This behavior is called flower constancy. Foragers are visually guided to the plant by its bright color and the shape of the petals as well as the interruptions between petals. A honey bee has no trouble telling a bitterweed from a golden aster blooming nearby. Ultraviolet nectar guides direct the honey bee to the nectary in the center of the flower. Bitterweed growing in pastures is normally passed over by grazing cattle. If dairy cattle feed on bitterweed, it is said that it will make the milk bitter. As honey bees forage on bitterweed and other fall flowers, the flavor of the honey changes from the mild flavored honey of the summer to a much more robust honey. With a diminished food supply of nectar from the flowering plants, the honey bee colonies also consumed large portions of their stores of honey. The honey bee is the only insect in the temperate zone that stays active throughout the year. All other insects either die off annually or go into hibernation. The honey bee exists over winter by consuming its high-energy food, honey. Beekeepers throughout the region are finding that there is not a great surplus of honey in the hives this year. 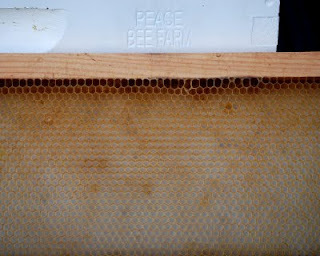 Today’s picture shows a not too unusual finding during this year’s honey harvest, completely empty frames. This year’s interrupted brood cycles left fewer bees on hand to produce honey. The beekeeper’s task this year will be to keep the bees alive and healthy. There won’t be a great surplus of honey to harvest this year. The asters are members of the important family of bee plants, the composites, or sunflower family. The composites make up one of the largest families of flowering plants in the world. Composites account for about 10 percent of all flowering plants, nearly 25 thousand species. The composites are important to the bees, as they are heavy producers of nectar and pollen. Other composite flowers include the sunflowers, yarrow, daisies, cornflower, or bachelor’s button, star thistle, or knapweed, coreopsis, coneflower, boneset, bitterweed, goldenrod, and dandelion. Composites that are considered of economic importance include lettuce, chicory, artichoke, chrysanthemum, and sunflower. Each of these plants depends upon bees for pollination. Today’s picture is of golden aster. Click on the picture to zoom in on a honey bee collecting golden aster pollen. She packs the pollen onto her pollen baskets on her hind legs. The bloom of the fall asters definitely indicates a change of seasons. Asters bloom throughout the spring, summer, and fall. However, the fall asters are the only ones heavily worked by honey bees. Pure aster honey is rather strong in flavor, but when aster nectar is added to nectar from other sources in the hive, distinct flavors arise. The honey from the same hive changes in flavor throughout the year and from year to year depending upon the flowers that happen to be blooming. This is the first year that I have found golden asters at Peace Bee Farm. I regularly find several species of fall asters in white and two or three hues of blue on the farm. Asters are native wildflowers that are often cultivated. Asters make a good addition to a pollinator garden. Honey bees are resilient creatures. In the short time that the small hive beetle has been in the United States, the adaptable honey bee has learned to live with this invasive species. The small hive beetle entered this country in about 1999, probably as a stow-away in a shipment of cargo from Africa. Many invasive plants and animals are inadvertently carried around the world through trade. We first detected the small hive beetle in the Arkansas Delta around 2004. At first, the hard-shelled beetles seemed to have free roam of the bee hives. However, within a few months, I noticed that the honey bees’ behavior was changing toward the small hive beetle. The bees aggressively sought out the beetles, chasing them into distant corners of the hive. Whenever a honey bee could catch a beetle, she would hold it and fly out of the hive with it. The honey bees quickly learned how to help control these insects that are protected by a shell tough enough to resist the bees’ bites and stings. They began to build jails in corners of the bee hive to house the beetles. These jails were actually small compartments constructed of bee glue, called propolis. A common location for a jail is the space between the end of each hive frame and the edge of the hive body. Click on the picture to see guard bees tending to their captured small hive beetles trapped in one of these spaces. On the right side of the photo, a small hive beetle tries to escape. You can see the head and thorax of the dark brown colored beetle. Its antennae look like they have balls at the ends. These balls are actually sensitive feather-like structures. Since the bees cannot kill the invading small hive beetles, they resort to containing them in the hive, preventing their reproduction in the cells of stored pollen. The honey bees will even feed their captive small hive beetles. Both humans and wildlife depend greatly upon the honey bee to pollinate plants so that they can produce fruit and seeds. Many game and songbirds consume a diet primarily comprised of seeds. One of the plants that provide large quantities of seed for quail and turkey is beggar’s lice, or tick trefoil. This common plant of wood margins is well-known by all who spend time outdoors in the late fall. The seeds of beggar’s lice are sticky triangles that adhere to clothing. Beggar’s lice has a very effective method of transporting its seeds to other locations. The seeds stick to the fur of mammals which may carry them great distances. Not only do numerous birds eat beggar’s lice seeds, the plant is readily browsed by deer. The beggar’ lice plant is a low vine with three leaves and a pink flower. Beggar’s lice belongs to the important bee plant family, the legumes. 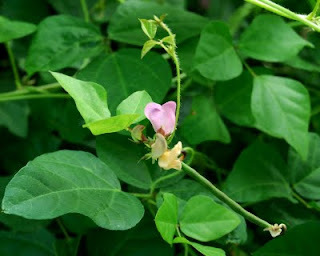 Other legumes include soybeans, clovers, vetch, redbud trees, and cultivated beans and peas. Throughout the summer, the beggar’s lice plant is a lush, low vine with three leaves, pink flowers, and developing seed pods. The plant clearly resembles the peas of the legume family. In the late fall, after the leaves have fallen from the vine, the plant seems to have disappeared. The only evidence of the plant is the lines of seeds clinging tightly to ones clothes. Some of the nature trails that I maintain through the woods in Peace Farm are lined with beggar’s lice. This legume performs an important role in feeding a number of wildlife species; and, through pollination, the honey bee plays an important role in reproducing the plant and producing its seed as wildlife food. I’ll try to remember that while I’m picking hundreds of seeds off my clothes after a hike through the woods this fall. There are times of the year when cars parked under certain trees get covered with fine droplets of a sticky substance. This is especially noticeable around oaks and tuluptrees in the spring and pecan trees at almost any time. 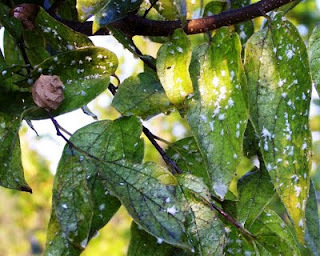 The leaves of sugarberry trees are now covered with this sticky substance, called honeydew. Honeydew is a sugary secretion from chewing or gnawing insects that attack certain trees. The insects derive carbohydrates from the saps of the trees and then secrete the honeydew. There is enough sugar in honeydew that honey bees will collect it and bring it back to the hive. The honeydew is mixed with enzymes in the bee’s honey gut and chemical changes start to occur. If enough of these sugary insect secretions are brought into the hive, a form of honey, which is also called honeydew, is produced. Click on the photo and you can see the discolored, shiny, sticky leaves of the sugarberry tree. The tree is infested with white flies, the irregular white spots on the leaves. As the white fly consumes the sap of the hackberry tree, it produces the sticky honeydew showing on the leaves. On the left side of the photo is the acorn-size mud bottle nest of the potter wasp, a native paralyzing wasp. Potter wasps capture beetle larvae, spiders, or caterpillars, paralyze them, and place them in the mud cell to serve as food for a potter wasp larva. The potter wasp lays an egg in the cell with the paralyzed provisions and then seals the mud bottle. The developing potter wasp derives nourishment from paralyzed insects or spiders; and the adult wasp derives nourishment from flower nectar, as do honey bees. It is thought that Native Americans based their pottery designs upon the potter wasp nest bottles. In beekeeping, one must be constantly making preparations for activities well in advance. Even though we are harvesting summer honey now, we are also making preparations for raising queen bees to use in next year’s colonies. One of the surest ways to have success in getting honey bees to start queen cells is to have a good nectar flow. To have plenty of nectar flowing in the vicinity of the queen production hives, we plant clover on any available pieces of land. In the picture, Rita helps by sewing ladino white clover by hand. Ladino is a popular variety of large clover from northern Italy. Clover, a cool-season crop, may be planted in the fall or spring. Evening temperatures in the 60s usually ensure the greatest planting success, as there is little competition from grasses and other plants. Clover is the most widely used honey producer in the world; and it is a legume, one of the important families of honey bee plants. The clover that Rita plants today should germinate this fall and produce numerous flowers next spring. The plants won’t actually produce much nectar until the following year, though. 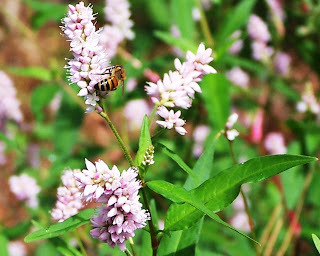 Clover produces the greatest amount of nectar when daytime temperatures fall between 80 and 90 degrees. 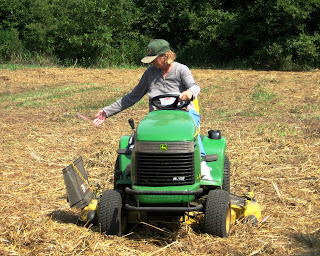 Along with feeding the honey bees, the cover crop of clover enriches the soil and feeds wildlife. Bacteria living in nodules on the roots of the clover convert nitrogen in the atmosphere to usable nitrogen in the soil. The clover plants will be heavily browsed by deer. Deer now visit Peace Bee Farm bee yards at night, returning in recent years after an absence of 80 years. With most of the Arkansas Delta cleared for row crop production, deer disappeared in many areas. They are making a come-back now. I feel like the pruning of the clover plants by the deer keeps the clover healthy and productive. For good bee health, it is important to have a free flow of air around the bee hive. Honey bees are capable of regulating the temperature and humidity of their hive to maintain a healthy environment for brood development. The modern bee hive provides for adequate ventilation in most circumstances. Screened bottom boards and telescoping covers with vented inner covers offer effective ventilation. The bees regulate the atmosphere inside the hive by clustering tightly together in cold weather and spreading out in hot weather. 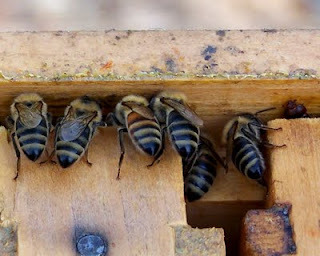 When conditions are extremely hot, bees exit the hive and rest on the outside surface of the hive or festoon from the landing board of the entrance. Moving a number of bees out of the hive makes for greater circulation of air. The bees can usually control the hive’s internal atmosphere by fanning their wings to circulate air. If cooling of the hive is needed, worker bees fan air across a droplet of water carried in their honey gut. Honey bees don’t store water in the hive. The bees themselves serve as a reservoir, holding water in their bodies in their honey gut. The set-up of the bee yard helps determine how the bees regulate the hive’s internal atmosphere. Air needs to be able to flow around the bee hives. In flat land of the Arkansas Delta, we place bee hives on stands to raise them above the damp ground. While I try to keep foliage away from my bee hives, this year’s more than frequent rains let some get overgrown. I found one covered with fast-growing milkweed vines, possibly blocking air flow around the hive. Inspecting the hive, I found some chalkbrood disease, a fungal condition. Click on the photo of the brood. Fungus-infected larvae appear as white pieces of chalk in the cells. Chalkbrood is usually not a serious bee infection. After removing the vine, and with some dry weather, the colony had removed the infected larva mummies and returned to health.